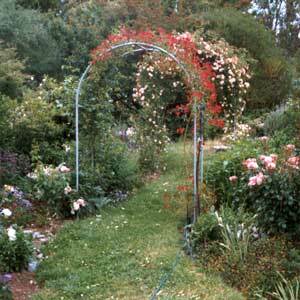 The first arch is covered from one side by a once flowering but absolutely beautiful rose Bloomfield Courage. This is an old American rambler with small cherry flowers. On the other side I've planted an unknown pale pink rose which every year reaches for the sky. This rose shows no fear - even after being brutally pruned. The second archway was originally covered with a pink rambler. This rose came to me wrongly labelled (that's my excuse, anyway), and it flourished for two years. Then it suddenly died of die-back, and I had to cut it out. In hindsight the demise of this rose was a blessing. A second plant of this same rose now spectacularly covers the nearby woodshed with its long reaching canes. 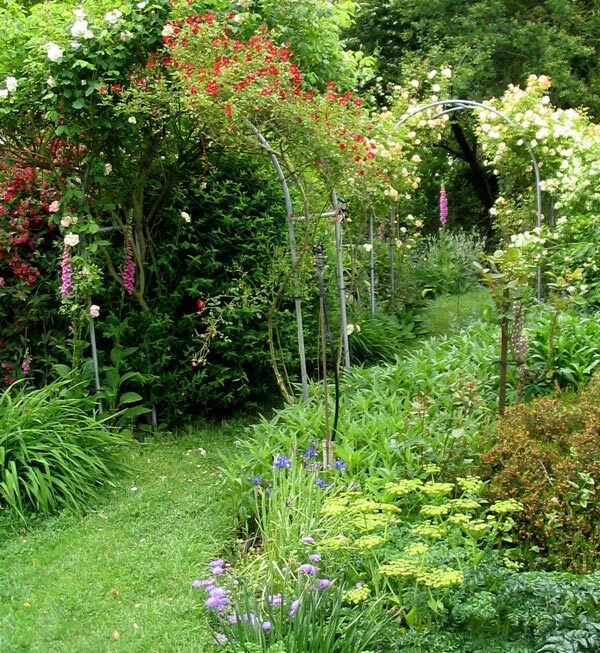 It's a rampant rambler with very vicious thorns, and would have been disastrous if left on the archway. 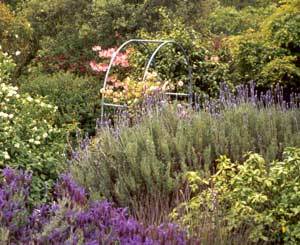 The newer plantings are two Phyllis Bides (either side) which are taking their time to join up. Phyllis Bide is known to be a modest climbing rose, and it's well known that older lady gardeners have trailer-loads of patience. The winds have been zooming through the gap since the Christmas of 1999 when the archways were first installed. So far, all is very well - maybe just a few degrees of lean. The border between the two archways and the house is filled with tall yellow daisies from midsummer on. There are also two refugee standard roses (one is memorially planted over the remains of old Ginger Puss), surrounded by white shasta daisies. This area is cut back in winter after the dahlias get frosted. Opposite the daisies is the shrub Hypericum which outgrows its allotted space every two or three years and has to be drastically pruned. It always flowers in my summer holidays. Assorted colours of Lychnis and blue and yellow pansies self seed at the base of both arches. The archways were specially built by a local welding firm. They had to be strong enough to support roses and stay upright in the fierce Canterbury winds. I want some more!